How many times have you heard that “caring for another human being is a privilege, but inside you feel frustrated, alone, and burnt out. You find yourself snapping at your mother after she repeatedly refuses to eat, or she’s forgotten to brush her teeth. You made a promise to your mother that you would love her, protect her and maintain the dignity she deserves but you find it a challenge to uphold your commitment. The tension in the house is constant as the role between the child and parent changes. Your career, personal and professional lives clash. What to do!!! Release your feelings in a positive way – go for a run, go out with friends, or see a movie. Find others who understand your experience – talk to them and learn how they have managed. Recognize that there are things you cannot control and let those go. Acknowledge you don’t have to do everything yourself – There are individuals that can help, family or getting home care support. 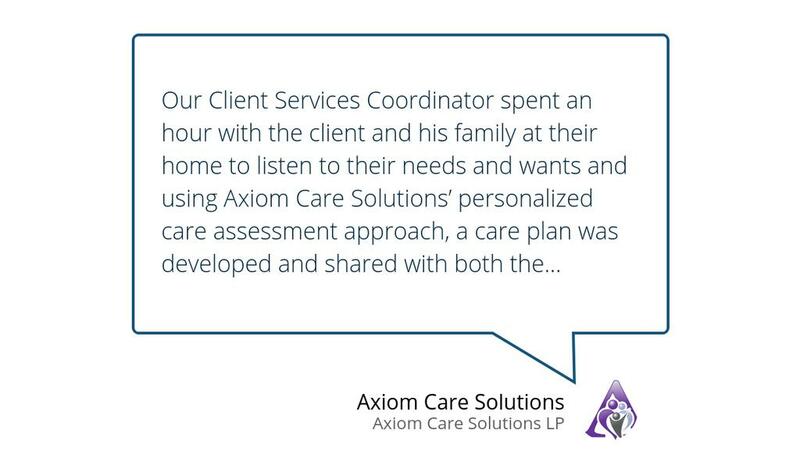 Axiom Care Solutions can help you with caring of your loved one. From managing their care to giving you some respite time. Contact us to learn more about our customized and personalized home care services that are tailored to fit your needs and wants.